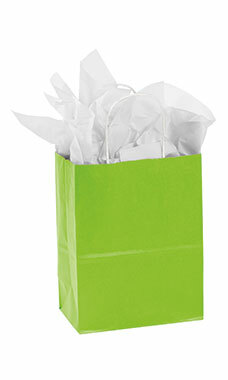 The Medium Lime Green Paper Shopping bags are a great packaging option for candles, scarves, hats and more! Featuring a vibrant lime green colored exterior with white interior and twisted handles, these durable shopping bags are perfect for boutiques, jewelers and retail stores! Add some tissue and ribbon and you have provided your customer with an instant gift bag! Sold in a case of 100 bags.